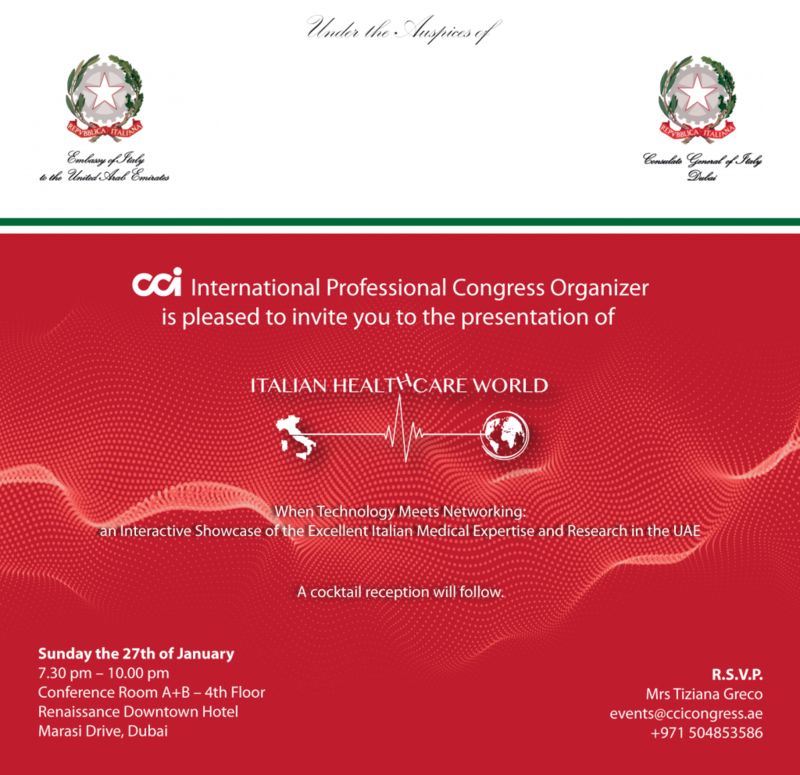 CCI Centro Congressi Internazionali Srl is glad to invite you at “Italian Healthcare World”, which will be organized in Dubai on the 27th of January. It will be an opportunity of information sharing: a moment in which both Italian Medical Representatives and Local Healthcare Representatives of Clinics, Hospitals, Universities, Insurances and other Entities and Institutions will be updated about the goals reached till now. It is preparing a panelist coordinated by the Italian Ambassador Liborio Stellino and Console Valentina Setta with some Italian bigwigs Doctors and Professors who will tell us about the successful and extraordinary projects they are following in their respective working places and we will present a medical platform created by one of the Italian Doctor. It will be a way to remark the existing cohesion between the Italian Medical Representative and UAE healthcare world allowing both of them to become an important, innovative and remarkable reference point in UAE and in the International Healthcare Community. For more information, please send an email to events@ccicongress.ae. 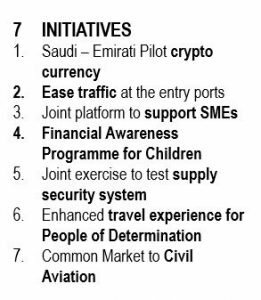 A selection of news articles that featured in official publications in UAE and Italy related to the business, economy and culture of the two countries. The Executive Committee of the Saudi – Emirati Coordination Council held its first meeting in Abu Dhabi with the participation of all 16 members from both sides to follow up on the execution of the joint initiatives outlined in the Strategy of Resolve. The strategy includes areas of collaboration and sets forth the joint vision of economic, social and military integration between the two countries. The committee announced the launch of seven strategic initiatives that reflect the bilateral integration in several important fields. The committee is tasked with ensuring the implementation of the joint initiatives. 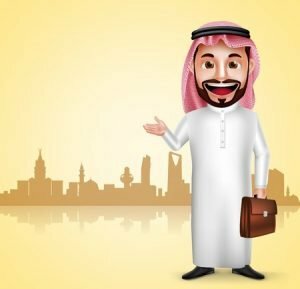 The global halal travel tourism market will keep on expanding over the coming years, as Muslim travellers feel more confident about exploring new locations that offer a variety of halal and family – friendly experiences. Projected to reach $157 bln by 2020, the Muslim travel sector is one the fastest growing segments of the travel industry worldwide. Indonesia, Malaysia and Turkey are the leading halal travel destinations and the UAE ranks one of the highest globally in halal tourism spending. In order to tap into this massive market, travel companies from around the world have been catering to the unique needs and requirements of consumers. 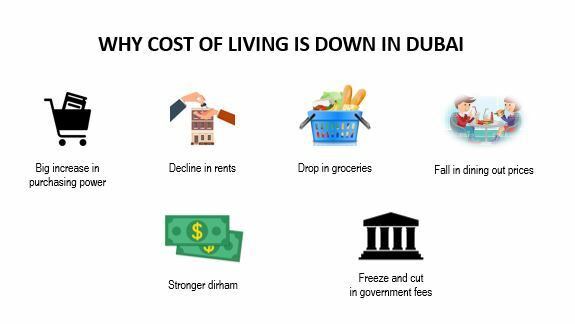 Thanks to a persistent decline in rents, reduced government fees and fines and freezing of school fees, Dubai has become even more affordable in 2019 compared to the last year with rentals and prices of groceries and restaurants declining on a year-on-year basis. According to the latest Cost of Living Index data, Dubai is rated as the 217th costliest city in the world in 2019 compared to 210th in the previous year – helped by a fall in inflation, a stronger dirham and a substantial increase in purchasing power of residents. Emiratisation of jobs increased by 200% in 2018, with plans to double the efforts this year. the Cabinet began last year with the allocation of Dh11 billion in social assistance to all groups of low-income Emiratis for the next three years. In 2019, which is the “Year of Tolerance”, the Government will present to the world the model of Emirati people who is dedicated at work, love their country, and tolerant with all people. throughout the year, the Cabinet rolled our major policies for community development. 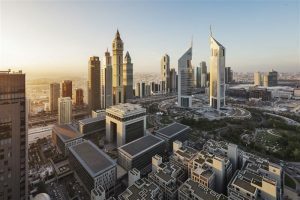 The UAE’s gross domestic product (GDP) will maintain its strong growth in 2019 and the next years, helped by higher investment and regulatory reforms, despite headwinds in the global economic growth. 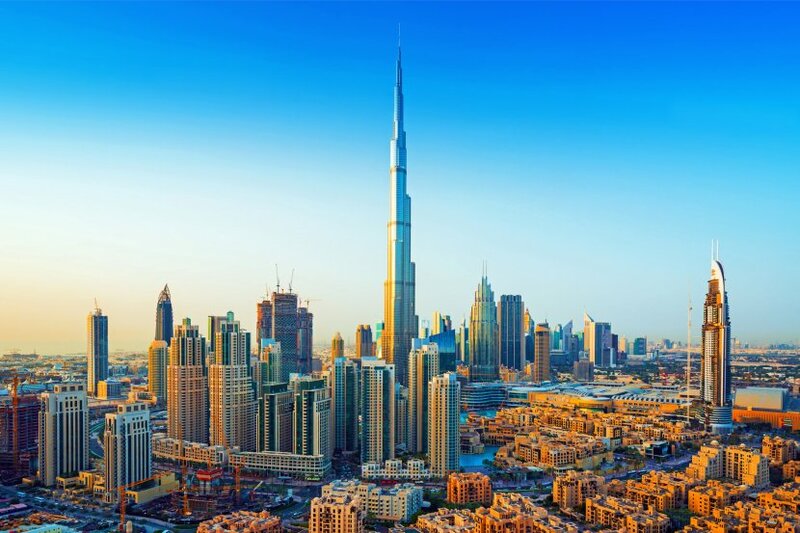 The World Bank said in its latest report that the UAE is expected to grow to accelerate to 3% in 2019 and 3.2% in the following two years of 2020 and 2021. With oil production and government spending set to rise, overall growth is projected to strengthen 2.9% this year and 3.7% next year. According to World’s Bank January 2019 Global Economic Prospects, growth among oil exporters is expected to pick up slightly this year, as GCC countries as a group accelerate to a 2.6% rate from 2% in 2018. 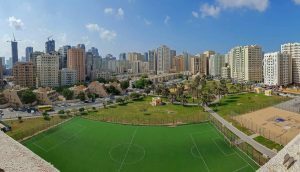 Determined to keep its environment green and community-friendly, the Emirate has built Dh100 mln worth of public parks through 2018. a total of 30 residential parks and walkways were constructed in different parts of Sharjah, under the directives of His Highness Dr Sheikh Sultan bin Mohammed Al Qasimi. The Ruler has also ordered the construction of three more parks and an entertainment centre in Muwailih for 2019. courts for sports activities, playgrounds, washrooms and recreational areas for families will be set up in these new venues. He said these projects aim to encourage residents to live an active lifestyle by making the most of the parks’ running and cycling tracks and other sports facilities. Dubai International Financial Centre (DIFC), the Region’s largest financial free zone, will undergo expansion in order to cement the Emirate’s position as a business capital and hub for international investment. Developing the financial sector is a priority that supports the economic future of Dubai and further enhances investor confidence, given the vital contribution it Makes to Dubai’s economy mainly through DIFC. 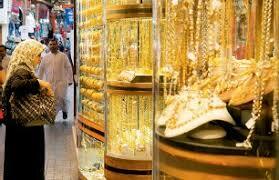 The Dubai Ruler approved the launch of the new chapter called DIFC 2.0 for the development of the free zone. 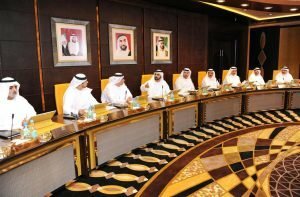 The announcement came following the 50-Year Charter recently announced by Sheikh Mohammed that aims to ensure Dubai’s sustained prosperity and accelerates the development journey of the Emirate, the UAE and the Region. The UAE’s luxury sector will witness improving sales across 2019, buoyed by the spending power of an increasing number of international tourists. The highest anticipated spend on luxury was recorded among consumers in the UK. The total market share of the global luxury market is set to reach $397 bln 2025. affluent Chinese consumers are projected to account for up to 44% of the global luxury consumption across the globe by 2025. 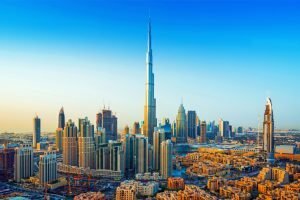 Dubai remains one of the top luxury destinations for Middle Eastern consumers as well as for Chinese and European visitors. Dubai is among the best cities in the world for luxury shopping and a crucial spending hub for the Region, with high-end shoppers coming from around the world.